Moving to Vietnam enabled Deboodt to capture images of the country’s rich geology—caves, volcanoes and mountains. Hang Son Doong in Vietnam is the largest cave in the world. It's more than 5.5 miles long, comes complete with its own jungle and river and is so gargantuan that it could apparently hold an entire block of 40-story skyscrapers within its walls. In this video, created by photographer Ryan Deboodt, embark on an aerial and ground tour of this stunning cave. Drone-captured footage gives a glimpse into the world within -- from otherworldly rock formations to the cave's lush fauna. Ryan Deboodt is a cave, adventure, and travel photographer based in Beijing, China. Most of his work has been based in Phong Nha Ke Bang National Park in Vietnam. 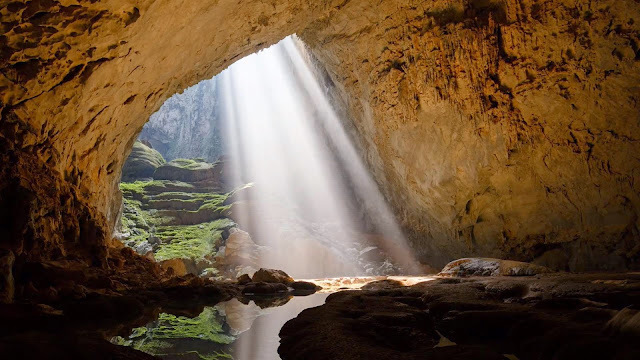 Here he has photographed many caves in the area, including Hang Son Doong, the world's largest. He has also travelled extensively and photographed in many places around the world. His work has been featured in various news outlets and magazines throughout the world, including Outdoor Magazin (Germany), Wanderlust, Heritage Magazine (Vietnam), news.com.au, The Guardian, and The Telegraph, as well as being featured online for both National Geographic and National Geographic Traveller. He also recieved an Honorable Mention in the Big Picture Natural World Photo Competition.